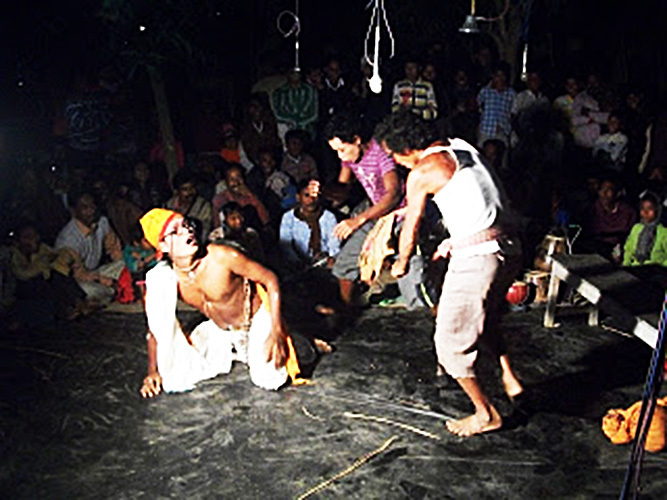 Khon gaan is a kind of folk drama that has been native to the local communities of erstwhile East Dinajpur (now Bangladesh) and West Dinajpur (now North and South Dinajpur of West Bengal) for more than 200 years. 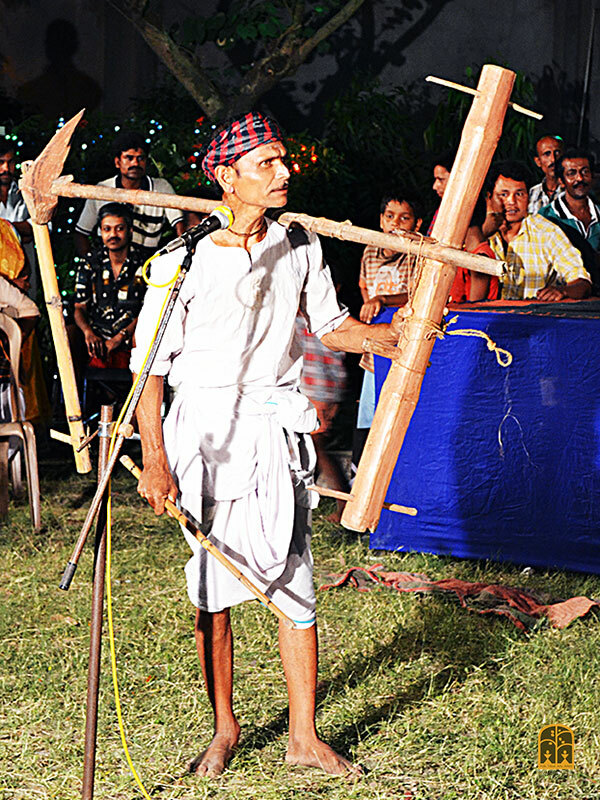 Traditionally its practice was mainly concentrated in the Kushmandi, Bansihari, Itahar, Hemtabad and Kaliaganj blocks of Dinajpur, but today professional Khon troupes are scattered all over both North and South Dinajpur in West Bengal. There are divergent views about the origin of the word, but it is generally accepted that Khon evolves from Khondo (Kando in Bengali) which means a curious or sensational event in the local Rajbongshi dialect. Khon dramas are usually extempore dramatizations of a recent scandal in the village - possibly to do with an illicit love affair or an inter-caste marriage. The period after the spring harvest (Nabanno), is generally a time of leisure for farmers. Some of this time is obviously spent on gossiping with friends and neighbours about interesting incidents or events of a salacious nature that have taken place in their neighbourhood or village in the past year. Intrepid village playwrights - oshiks (the word is actually roshik meaning connoisseur or aesthete: Rajbongshis tend to drop "R") or oshias (roshias) use such khondos that have occurred across the villages of (North and South) Dinajpur as the basis for their plays, set against a background of daily life in the village. Often more than one Khon drama emerges from this selection of juicy gossip. The play is usually pieced together like a musical. The dialogues, in the local Rajbongshi dialect are usually in the form of songs - sung by the hero and heroine or other characters. Sometimes normal dialogue is also used to connect the events, in order to give shape to the story. The Khon, presented in a lively and pragmatic form, becomes a reflection of the mores of rural society and its function is to educate villagers on moral values. The theme or the plots keep changing each year, ensuring continued interest and curiosity among the rural audience. These are the Khisha palas: the word Khisha comes from kechcha (scandal). Apart from such current events, Khon has also been used as a vehicle to teach moral values through religious tales from Puranic texts. These are the Shastori palas - from the shastras. Both types of plays or palas are generally named after the heroines. In the drama, the songs sung are called Shori gaan. Shori refers to a woman who has disregarded and moved away from the norms of society. The woman in these plays usually has a shori appended to her name. Some well known Khon plays are Budhasari, Cyclesari and Dhakoshori. The Khon performance season starts after the winter harvest each year - between autumn and winter, that is, between the Bengali months of Kartik (mid October) and Choitra (mid April). 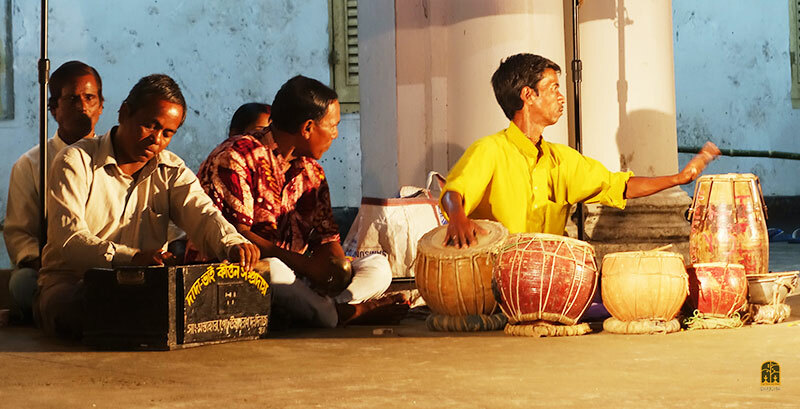 A team of Khon players , together with harmonium, tabla and kartal players, move from village to village, with their repertoire, performing at the homes of the well to do. Each group of performers is headed by a Dalopoti or manager. Farmers use this performance not only for their own entertainment but also as a necessary break from the hard labour of the year gone by. These days however, there are professional Khon groups. Traditionally, the performance (ashor) usually takes place either in the courtyard of a village home or in a nearby field. The actors (gayen) and the musicians (bayen) take their place within an inner circle and are surrounded by the audience. The chief performer or singer is the geedal. With the exception of the jester and the male actors playing female roles (chhokras), all the performers are dressed in their simple every day clothes. 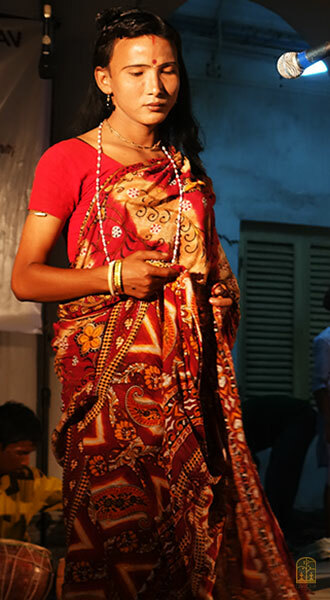 The chhokras wear saris with colourful blouses, glass bangles, necklaces, and wigs shaped into a bun. In earlier times, they would wear the village woman`s attire, a sort of wrap from the chest to the knee. But this was soon replaced with the sari, since this attire on men was often greeted with mirth and derision from the audience. Currently however, women have begun to participate as well. The drama opens with a musical concert performed by instrumentalists on the dhol, kartal, tabla, flute and harmonium (which is increasingly being replaced by a synthesizer). But half a century ago, only the dhol, flute, kartal would be used. The musicians are also the vocal accompanists, the Duaris who repeat each line sung by the main singer. This is followed by an invocation to the deities (as in Sanskrit dramas) known as the Bandona in which both hero and heroine take part, after which the play begins. The dialogues are delivered extempore on the theme of the play while the musical dialogues are composed in advance. (In an earlier time, the songs would be sung extempore as well or composed by the actors themselves - there were no written scripts). There are also dance interludes. In the old days, the hero and heroine would have a red cloth in their hands, which they would bring close to their lips every time they spoke. Performances start late in the evening and may continue till the wee hours of the morning. Some plays become so popular that the group is invited to perform all over the district - and thus the local context spreads to a wider area. Therefore the Desi, Poli, Rajbonghsi cultural aspects in a Khon play get a wider audience even among other cultural groups. And it goes without saying that Muslims, who are very much part of the centuries old syncretic local culture, take part in and also compose Khon plays. Khon performers of today say that the sole aim of a Khon pala is to educate society. They often stitch together several incidents of illicit or dishonest activity that they have witnessed or heard about and then write a pala on it, to make people aware of what is happening. Some of the Khon palas are based on imaginary incidents or on modern ways frowned upon by rural elders. For instance, plays have been written making fun of the western wear that village youth seem to prefer, (jeans for the men and the ubiquitous "maxis" or "nighties" that young rural women have developed a fondness for), instead of traditional attire. Khon palas are often created to cater to public demands. However, there are also many old Khon palas which still do the rounds, both Puranic and situational. 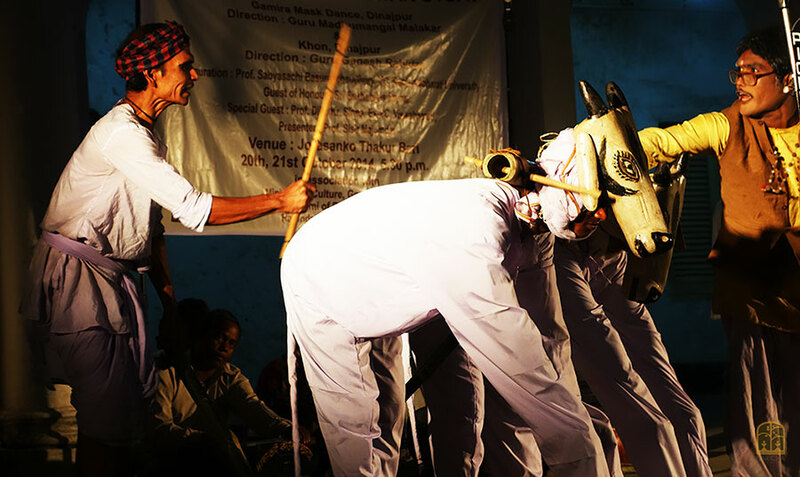 There have been recent attempts at popularising the form outside the district and Khon has been featured at a few folk culture events in Kolkata, with the performance taking place on a regular stage.